Happy Michaelmas to my readers! 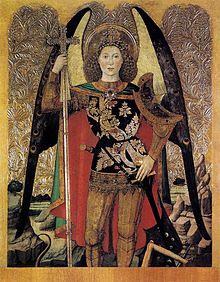 On this day dedicated to the honour of the glorious leader of the heavenly armies, St Michael the Archangel, I thought it would be useful to reproduce the 'long' Prayer to Michael, published in 1890, a few years after the familiar short one used at the end of the Traditional Mass, by the same author, Pope Leo XIII. He composed it for use in exorcisms: the prayer of exorcism itself comes next. I take this from Kevin Symonds, The Prayer to St Michael. This book gives a thorough account of the historical and supernatural background to both prayers to St Michael. As Symonds notes, exorcisms are not to be used by the laity; I reproduce it here because of its historical interest; its own seems to have a wider application, in any case. O most glorious prince of the heavenly hosts, St. Michael the Archangel, defend us in our battle and struggle ‘against principalities and powers, against the rulers of this world of darkness, against the spirits of wickedness in high places’ (Eph.6:12). Come to the aid of men whom God has created incorruptible and has made to the image of His likeness (Wis. 2:23) and has bought at a great price from the tyranny of the devil (1Cor.6:20). O fight today with the army of blessed angels in the battle of the Lord, as formerly you fought against the leader of pride, Lucifer, and his rebellious angels - ‘and they did not prevail, neither was their place found anymore in heaven. And the great dragon was cast down, the ancient serpent, he who is called the devil and Satan, who leads astray the whole world; and he was cast down to the earth, and with him his angels were cast down’ (Apoc.12:8-9). Behold the ancient enemy and murderer has risen up terribly! Transformed as an angel of light he goes about at large with a whole troop of wicked spirits and attacks the earth, there to blot out the Name of God and of His Christ, and to steal souls destined for a crown of eternal glory, that he might afflict and destroy them in everlasting death. On men depraved in mind and corrupt in heart the wicked dragon pours out the poison of his iniquity as a most foul river; a spirit of lying, of ungodliness and of blasphemy and the deadly breath of lust, of all iniquity and vices. The most cunning enemies have filled the Church, pride of the Immaculate Lamb, with bitterness; they have drenched Her with gall, they have laid their impious hands on all things desired of Holy Church. There the See of Blessed Peter and the Chair of Truth has been established as the light of the nations, there have they placed the throne of the abomination of their impiety, so that having struck the Pastor they may also prevail to scatter the flock. O leader most invincible, be present with God's people against invading evil spirits, and bring us victory. Holy Church venerates thee as her guardian and protector; She takes pride in thee as her defender against the wicked powers of earth and hell; to thee the Lord has entrusted the souls of the redeemed, to be placed in heavenly bliss. Beseech the God of peace to crush Satan under our feet, that he may no longer be able to hold men captive and harm the Church. Bear our prayers into the sight of the Most High, so that the mercies of the Lord may come to our aid without delay, and that you may seize the dragon, the ancient serpent which is the devil and Satan, and cast him into the bottomless pit, ‘so that he may no more seduce the nations’ (Apoc. 20:23). Hence, trusting in thy support and protection, (in the sacred authority of our ministry), and confident and fearless in the Name of Jesus Christ our God and Lord, we approach to repulse the assaults and deceptions of the devil. V. Behold the Cross of the Lord! Flee bands of enemies. R. The Lion of the Tribe of Juda, the offspring of David hath conquered. V. May Thy mercy, O Lord, descend upon us. O God and Father of our Lord Jesus Christ, we call upon Thy Holy Name and suppliantly entreat Thy clemency, that, by the intercession of Mary the Immaculate and ever-Virgin Mother of God, of Blessed Michael the Archangel, of Saint Joseph, spouse of the same Blessed Virgin, of the Blessed Apostles Peter and Paul, and of all the Saints, Thou mayst deign to grant us Thy help against Satan and all other unclean spirits who rove about the world to harm mankind and destroy souls. Through the same Christ our Lord. Amen. The shorter version encapsulates all of this & is much more easily remembered &, therefore, more likely to be prayed often. It is, of course, prayed after all Low Masses in the EF.